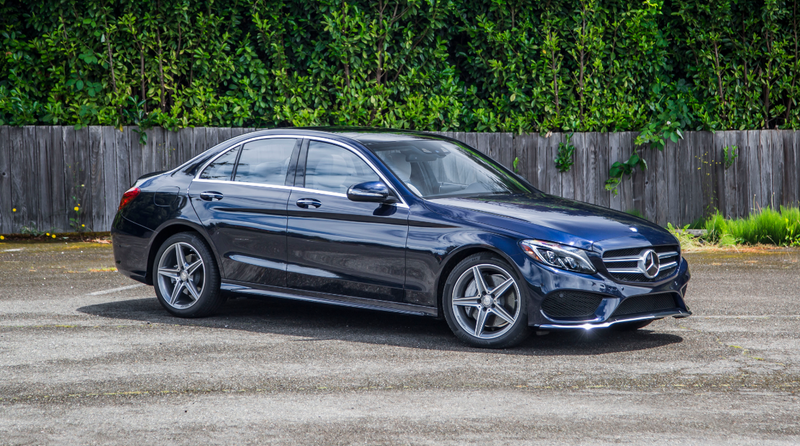 The Mercedes C-Class is the most classically beautiful luxury sedan you can afford to buy. What do you need to know before you buy an C-Class? Don’t worry, we’ll tell you everything right here in the Ultimate Buyer’s Guide. There was a time when the Mercedes C-Class was entry-level luxury here in the United States. To purchase such a car demonstrated that you were doing pretty well and on your way to do better and buy something bigger like an E-Class or, maybe if Old Man Wurthers kicked the bucket, an S-Class. With the introduction of the CLA and GLA there’s now a level of cars you can acquire underneath the C-Class if you’re a striving millennial with your first junior-level law job. This has forced the C-Class to move slightly further upscale to compete not only with other German, American, and Asian offerings but also with itself. The current iteration of the C-Class is more luxurious, more poised and just about “more” everything else. Normally, we’d complain that the car getting bigger robs you of performance, but the C-Class was always about enjoying the journey to and from work and not turning the journey itself into work. With the added size also comes more space for a gorgeous body and a ton of technology. The C-Class will make anyone feel like a plutocrat, thanks to an exterior that looks like it was sculpted out of polished marble and an interior hewn from the softest silks... or at least softest MB-Tex. In base-level C300 trim, the AWD (4MATIC) system does a competent job of keeping the car planted in the wet while the base 2.0-liter turbo inline-four propels it forward without you noticing how much heft there is. That base engine only puts out 241 horsepower and 273 lb-ft of torque, which once would be considered remarkable for a small engine but now puts the car right where the rest of the competition is. If you want more, there’s always the 362 horsepower biturbo V6 in the C450 or 469 horsepower V8 in the C63. But most people will be buying the C300 and they’ll get a car that is adequately fast and more than adequately comfortable and well-appointed. It’s a car that feels like an S-Class that’s been collapsed into a smaller, more city-friendly car. The C-Class Coupe has been around since the stone ages. And by “stone ages,” we really mean “2012.” Yes, the C-Class Coupe is built on the older W204’s post-facelift platform, and between its 2012 launch and now, it really hasn’t changed much. The C-Class sedan, on the other hand, got the royal treatment in 2015 when it moved to Mercedes’s brand new Modular Rear-Wheel Drive (MRA) architecture and became the W205. The longer 2015 C-Class sedan received gorgeous new exterior styling with all-aluminum sheetmetal, a fresh interior, new powertrain options and lots of new safety tech. For 2016, Mercedes replaced the C400 trim with the the 3.0-liter twin-turbo C450 AMG Sport. Also new for ‘16 was a C300d diesel and C350E Plug-In Hybrid. Fuel economy and other technical specs are out for the C450 AMG Sport, but numbers for the diesel and hybrid are still under wraps. Next year, the 2017 C-Class Coupe will follow in the sedan’s footsteps and go to the new MRA platform. The first models released will be the two-wheel drive and four-wheel drive C300 coupes, both powered by the same 2.0-liter turbo four bolted to a 7-speed auto as found in the sedan. Powertrain options are all over the board for now. When the coupe makes the swap to the MRA architecture, the powertrain options will be whittled down. For now, the C-Class coupe can be had with a 1.8-liter turbo four, 3.5-liter V6 or 6.3-liter V8, while the C-Class sedan gets the 2.0-liter turbo I4, 2.0-liter hybrid I4, 2.1-liter turbodiesel, 3.0-liter twin-turbo V6 or 4.0-liter twin-turbo V8. For a vehicle that weighs between 3,400 and 3,900 pounds, the power and torque figures are all more than adequate. Even the tiny 1.8-liter in the coupe cranks out over 200 ponies and 229 lb-ft of torque. Next year, the 241 horsepower, 273 lb-ft 2.0-liter from the C300 sedan will be the base engine on the revised coupe. The six-cylinder options make over 300 horsepower, but you can expect the 3.5 to be replaced by the more powerful, more efficient 3.0-liter twin-turbo when the coupe makes the jump and becomes a W205. On the Holy Crap side of the spectrum, the C63 AMGs make anywhere from 451 horses on the huge 6.3-liter coupe to 503 horses on the AMG S Sedan. The 6.3-liter V8’s days might be numbered, but the 4.0-liter twin-turbo V8 is an absolute titan, so we’re not complaining. Fuel economy numbers are very good, particularly for the new generation sedan, whose two, three and four-liter engines all out-pace the coupe’s corresponding engine offerings in both power and economy. The sedan’s combined fuel economy numbers of 28, 24 and 20 for the three engines are spot on with those of BMW’s 3-series, which is considered near the top of the class in efficiency. Hybrid and diesel fuel economy numbers are not yet available for the 300e and 300d, respectively, but we’re excited to see where those end up. The coupe’s numbers aren’t quite where they should be, but after next year’s update, all C-Class trims should wind up with sufficiently powerful, efficient powertrains. The C-Class comes in coupe and sedan form. The coupe comes in either C250, C350 or C63 AMG Coupe, while the sedan comes in C300, C300e, C300d, C450 AMG, AMG C63 and AMG C63 S trims. The diesel C300d and hybrid C300e are not yet for sale, but they will be available later in 2016. Steering is electric and suspension is multi-link all the way around with either coils or air springs. Front disc brake sizes are all over the place. They range from 11.6-inches on the C250 to 13 on the C300 to enormous 15-inchers on the AMG Sedan. In the rear, you’ll get either 11.8, 12.6, 13 or 14.2-inch rotors. C300 Sedan: Starts at $38,950. Notable standard features: 2.0-liter turbo I4, 7-speed automatic transmission, selectable drive modes, 17” alloy wheels, Collision Prevention Assist Plus, Attention Assist, LED daytime running lamps, Crosswind Assist, Pre-Safe, seven airbags, Adaptive Braking, rain sensing wipers, keyless start, 14-way power driver seat, dual-zone automatic climate control, split-folding rear seats, power-folding side mirrors, 7” infotainment screen, touchpad controller. Notable options: All-wheel drive ($2,000); Luxury Package: Luxury Styling, Comfort-tuned suspension, unique 17” wheels, stitched upper dashboard (total: $39,275); Sport Package: AMG body styling, 18” AMG wheels, sport-tuned suspension, sport interior, stitched dash, perforated front brakes (total: $41,125); Airmatic Package: Airmatic air suspension, dynamic select suspension modes ($1,190); Parking Assist Package: Parktronic with Active Parking Assist, surround View System ($1,290); Premium 2 Package: Keyless Go, Satellite Radio, LED headlamps and fiber-optic taillamps, Burmester 13-speaker Premium Surround Sound ($2,220); Interior Package: Leather upholstery, heated and vented front seats, power passenger seat with memory, illuminated door sills ($2,880+Premium 2 Package); Multimedia Package: rearview camera, navigation with 8.4-inch screen, satellite traffic and weather for 5 years ($2,690); Driver Assistance Package: Distronic Plus adaptive cruise control with Steering Assist, BAS Plus with Cross Traffic Assist, Pre-Safe Brake with Pedestrian Recognition, Pre-Safe Plus, Active Blind Spot Assist, Active Lane Keeping Assist, Traffic Sign Assist ($2,800). 2015 C250 Coupe: Starts at $39,400. Notable standard features: 1.8-liter turbo I4, 7-speed automatic, Agility Control active suspension, lowered, sport tuned suspension, 17” alloy wheels, Panorama roof, 3.5-inch cluster display, 9 airbags, Attention Assist, LED daytime running lights, rain sensing wipers, dual-zone climate control, sport seats, heated front seats, Harman/Kardon 8-speaker audio system, 5.8-inch color display for infotainment. Notable options: Sport Plus Package: 18” alloy wheels, rear spoiler, black side mirrors, unique black upholstery, sport steering wheel, larger brakes, performance tuned exhaust and transmission with downshift rev-matching ($2,800); Multimedia Package: Rearview Camera, navigation, voice control, 7-inch screen, DVD/CD player ($2,770); Leather Package: leather upholstery on all seating surfaces, 14-way power front passenger seat with memory ($1,750): Lighting Package: Bi-Xenon headlamps with Active Curve Illumination, Adaptive Highbeam Assist ($1,390); Driver Assistance Package: Distronic Plus adaptive cruise control, Pre-Safe Brake, Active Blind Spot Assist, Active Lane Keeping Assist, Pre-Safe ($2,950); Appearance Package: 18” AMG wheels, exclusive front seat design, black vinyl upholstery, unique topstitching on seats and door inserts, black floor mats, sport steering wheel, Keyless Go ($2,300). 2015 C350 Coupe: Starts at $44,050. Notable standard features over C250 Coupe: 3.5-liter V6, rear spoiler, 18” alloy wheels, panoramic sunroof, wood trim. Notable options: all-wheel drive (2,000); Leather Package ($1,750); Multimedia Package ($2,770); Appearance Package ($2,300); Sport Package: (2,3000); Driver Assist Package ($2,950); Lighting Package ($1,390). C450 AMG: Starts at $50,800. Notable standard features over C300 Sedan: AMG-tuned 3.0-liter biturbo V6, start/stop, all-wheel drive, 7-speed transmission, adaptive suspension, AMG performance brakes, AMG sports exhaust, torque vectoring brake, AMG sport steering wheel, 18” alloy wheels, AMG exterior and interior trim, aluminum pedals, Blind Spot Assist, 14-way power driver seat with memory. Notable options: Multimedia Package: navigation with 8.4-inch screen, voice control, satellite traffic and weather for 5 years ($2,230); Premium 2 Package: LED headlamps and fiber-optic LED taillamps, Burmester 13-speaker sound system ($1,520); Driver Assistance Package ($2,250); Interior Package: Leather seats, heated front seats, power front passenger seat with memory, illuminated door sills ($2,880+Premium 2 Package); Parking Assist Package ($1,290). 2015 C63 AMG Coupe: Starts at $63,000. Notable standard features: 6.3-liter V8, 7-speed multiclutch transmission, exclusive front axle, AMG sport suspension, 18” alloy wheels, AMG body styling, 9 airbags, Attention Assist, LED daytime Running lamps, LED taillamps, rain sensing wipers, vinyl upholstery, dual-zone climate control, AMG sport seats, heated front seats, 14-way power driver seat with memory, auto dimming mirrors, Harman/Kardon 400 watt 8-speaker audio system, 5.8-inch center display, Bi-Xenon headamps with active curve illumination, Adaptive Highbeam Assist. Notable options: Driver Assist Package: Distronic Plus adaptive cruise control, Pre-Safe Brake, Active Blind Spot Assist, Active Lane Keeping Assist, Pre-Safe ($2,950); Edition 507 Package: Increased engine output to 507 horses, top track speed up to 174, AMG performance braking system, 19” alloys, aluminum hood from C63 AMG Black Series, rear lip spoiler, leather black interior, ($9,750); Multimedia Package: Rearview Camera, navigation, 7-inch display ($2,770); Leather Package: Leather seating surfaces, 14-power front passenger seat with memory, black headliner ($2,590). AMG C63 Sedan: Starts at $65,250. Notable standard features over C450 AMG: 4.0-liter biTurbo V8, start/stop, Burmester 13-speaker Surround Sound audio system, Attention Assist Driver Drowsiness Monitor, 7-speed multi-clutch transmission, unique front axle and wider track, adaptive suspension, bi-xenon HID headlamps, Limited slip diff, AMG interior and exterior styling and trim, unique 18” alloy wheels, stitched upper dash, heated front seats. Same options as C450 AMG. AMG C63 S Sedan: Starts at $73,250. Notable options over AMG C63 Sedan: 516 horsepower 4.0-liter biturbo V8, dynamic engine mounts, 19” alloy wheels, LED headlights with LED taillights. Notable options: Same a C450 AMG minus Premium 2 Package and plus a Lighting Package: Active full-LED headlamps and LED taillamps, Adaptive Highbeam Assist, Active Curve Illumination ($800); Dynamic Performance Exhaust ($1,250). If we were looking to buy a mini S-Class, and we didn’t want to wait a year for the updated coupe, we’d grab ourselves either a base C300, which offers great value at $42,050 out the door, or if we wanted more power and sporting cred (we’re Jalopnik, so we do), we’d option up a C450 AMG. The C450 doesn’t make 500 horsepower like the C63 cars do, but that 7-speed automatic and the standard all-wheel drive make the most of those ponies and get the 3,700 pound Merc to 60 in a quick 4.9 seconds. Not to mention, the C450 still gets AMG performance goodies like upgraded brakes and suspension, and yet it costs nearly 15 grand less than the C63 brothers. Plus, the C450 manages 29 MPG highway–that’s four MPGs better than the C63s. All in with destination for a base C450, you’ll pay $51,725.